My mum is a great cook for the family and I aspire to be like her one day. She whips up delicious meals for the family – from a simple meal for my dad and herself, to a table filled with different dishes for the whole gang of 10 during occasions such as Chinese New Year or family get-together. She has her own secret seasoning method and recipes which I can never taste the same outside. The best is, she can easily win my children over with her food – EVERYTIME! Dawn had even told my mum to impart her skills to me! I really have a lot of catching-up to do as the benchmark & expectation is set so high! I finally had a chance to cook a quick meal for the family when my in-laws were away on a Sunday. Decided to cook Bee Hoon Soup, and it’s one of Dawn’s favourite meal at my mom’s place. Now, cooking bee hoon soup does not sound like a difficult task to most of us. What can go wrong, right? The fact why Dawn likes the one that my mom cooks rather than those that we can get in coffee shops or hawker, is because of the minced pork. Yes, you read it correctly, it’s the minced pork. The marination of the minced pork can turn this meal from a “commercial” meal to a simply home-cooked comfort food. And guess what? Dawn said “Mmmmm, taste like Poh Poh’s one” (“Poh Poh” is how she calls my mom)! I got thumbs-up from my dearies! Bring the stock & water to boil. Scoop the minced meat with a spoon and drop them separately into the boiling soup. Add fish balls and meat balls when the minced meat is cooked. When the fish/meat balls float to the surface, add the vegetables. In a separate pot of boiling water, blanch the thick bee hoon. Make sure the water is boiling before taking out the bee hoon and divide them into different serving bowls. 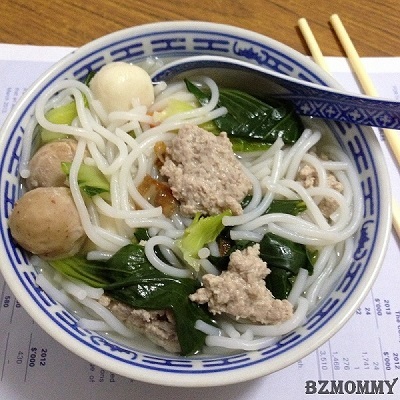 Ladle the meat, fish/meat balls, vegetables and soup over the cooked bee hoon. Garnish to your liking (fried shallots, spring onions, cut chilli etc). Ready to serve! This entry was posted in BZ Kitchen, Child Friendly Recipes, One-Dish and tagged Recipes.